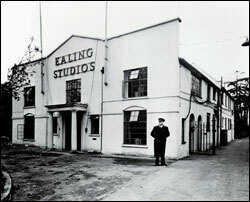 In 1938, producer Michael Balcon took over the reins of the struggling Associated Talking Pictures studio, established in 1931 at Ealing in West London by theatre impresario Basil Dean. Balcon was already well established in in British film, as production head at Gainsborough Pictures and Gaumont-British and an early mentor of Alfred Hitchcock, and he had strong ideas about how a successful studio should operate. Balcon set about fostering a collaborative atmosphere, exemplified by regular meetings around the famous round table, where attendees were encouraged to comment on each others' projects. Balcon's Ealing became "the studio with the team spirit", and inspired great loyalty among its tightly-knit crew of directors, writers, technicians and performers, despite their comparatively humble salaries. These were the men and women who made Ealing Britain's best-loved studio.